Despite an existing extradition agreement, Kiev has refused to hand over Georgia’s ex-president Mikhail Saakashvili and former justice minister Zurab Adeishvili to Tbilisi, the Georgia’s chief prosecutor’s office said. “The Ukrainian side has failed to cooperate with the Office of the Chief Prosecutor of Georgia in the matter of the extradition of Mikhail Saakashvili and Zurab Adeishvili to Georgia, and has refused to extradite the above mentioned persons,” a statement on Georgian chief prosecutor’s office website said. Kiev’s failure to extradite former Georgian officials is a violation of several international conventions and a bilateral agreement between Georgia and Ukraine, it added. “Extradition of wanted persons between Ukraine and Georgia is carried out according to the European Convention on Extradition of 1957, the Minsk Convention on Legal Assistance and Legal Relations in Civil, Family and Criminal Matters of 1993, and a bilateral agreement signed between Georgia and Ukraine in 1995,” the statement said. Last week, Saakashvili was appointed a non-staff adviser to Ukrainian President Petro Poroshenko. The 46-year-old will head the Advisory International Council of Reforms, tasked with coming up with proposals and recommendations for implementing reforms in Ukraine based on leading international practices. At home, the ex-Georgian president faces numerous charges, including embezzlement of over $5 million, corruption and brutality against protesters, dating from his time in power from 2004 to 2013. Saakashvili is noted for his strong anti-Russian stance, which reached its peak when Georgia launched the August 2008 offensive against South Ossetia. Hundreds of civilians and more than 10 Russian peacekeepers were killed in the first wave of heavy shelling on the city of Tskhinvali on August 8, which prompted then-Russian President Dmitry Medvedev to order a military operation to “enforce peace” in the region. Despite Saakashvili’s claims that the conflict was “Russian aggression,” an EU fact finding mission ruled that Tbilisi was responsible for the attack. 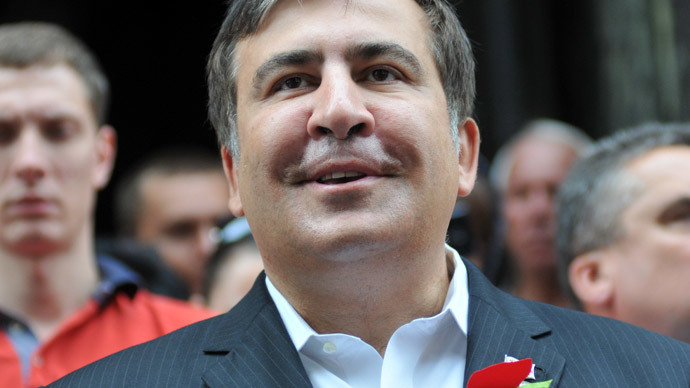 Since the end of his rule, Saakashvili has been living in exile in the US. Last summer, Georgia’s Chief Prosecutor Office launched proceedings to indict the ex-president and place him on an international most-wanted list in August. Saakashvili was offered the position of first deputy prime minister of Ukraine last December, but he refused the appointment, saying he doesn’t want to renounce his Georgian citizenship. Georgia also wants former minister of justice, Zurab Adeishvili, who currently advises the Ukrainian government on developing anti-corruption legislation. He was put on an Interpol wanted list in 2013 by Georgia. Georgian prosecutors accuse Adeishvili of abuse of power, inhumane and humiliating treatment of inmates in Georgian prisons as well as fabrication of evidence in a criminal case. Since he took office, the Ukrainian president has been surrounding himself with a team of foreign assistants. In December, he confirmed that Ukrainian citizenship had been granted to US, Georgian and Lithuanian nationals, who were appointed for cabinet jobs. One included US-born Natalie Jaresko, who has taken up the post of Ukraine’s finance chief.